I think Perko's Wrapped Lemons refers to McCloskey's Florida Lemons (below). Perko's painting lets us imagine a world where our eyes can separate planes of vision. This feature, along with her use of depthless color achieved through barely visible brushwork, makes this a true cubist artwork. There is a sad story about the McCloskey painting. According to The City Review (May 21, 2014), it was offered for sale at auction in New York City but "It failed to sell." We are spoiled; we take the year-round availability for granted of any fruit we desire. Historically speaking, this state of things began just yesterday but there are artists whose works remind us of the magical properties of fruit, especially citrus fruit, with its contrasts of sweetness and tartness in seductively tactile containers. 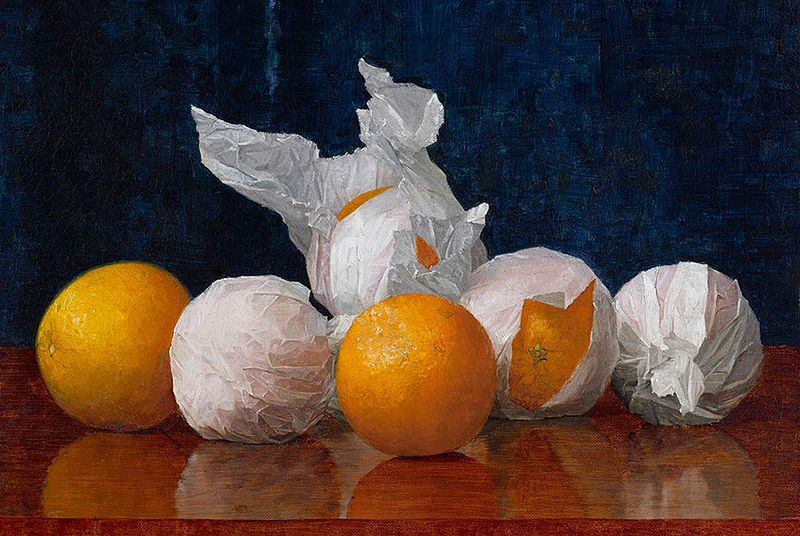 Wrapped Oranges, painted in 1889 by the little known William J. McCloskey, brought me up short when I first saw it (see below). These arrangements of fruits in tissue on what appear to be tabletops evoke a mysterious sense of place out of time, much as the Danish painter Vilhelm Hammershoi' s empty rooms do. Tissue was the preferred method for packing these precious fruits for shipping before the days of refrigerated trucks.. The story of American still life painting begins with the Peales (Charles Wilson Peale, Rembrandt Peale, Raphaelle Peale, Titian Peale, and Margaretta Peale to name just five of the prolific and close-knit family). Their paintings were among the best that a new nation produced during its early decades. The Peales were also known as experimenters in tromp l'oeil, a technique used to deceive the eye into seeing relationships between planes and dimensions that are not there in ostensibly realistic spatting. Like the Peales, WillIma McCloskey and his wife Alberta Binford, painted works of great technical virtuosity; William excelled in portraits and fruit, Alberta in portraits and floral still lifes. It was while staying in Los Angeles during the 1880s that the young couple established their artistic reputations. Already southern California had begun to promote itself as the garden state of the west, home to plentiful orange groves. An unusual couple in many respects, the McCloskeys did not stay put, making their whereabouts at any given moment hard to pin down; but they lived in New York City (on 23rd Street near the Art Students League), London, and Paris and exhibited their works in Atlanta, Buffalo, and Providence, at least. Neglected after their deaths, McCloskey's wrapped fruits again attracted public interest beginning in the 1990s. Both artists bring to the table, so to speak, an enthusiasm for paint that makes joie de vivre tactile. 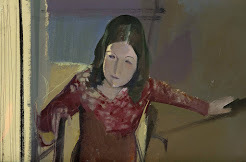 Angela Perko is represented by Sullivan Goss: An American Gallery, Santa Barbara. For further reading about William McCloskey: Partners In Illusion: Alberta Binford and William J. McCloskey by Nancy D.W. Moure, Santa Ana, Bowers Museum of Art: 1996. 1. Angela Perko - Wrapped Lemons apres W. J. McCloskey, 2015, Sullivan Goss: An American Art Gallery, Santa Barbara. 2. William J. McCloskey - Florida Lemons, 1919, Sotheby's, NYC. 3. William J. McCloskey - Wrapped Oranges, 1889, Amon Carter Museum, Fort Worth. Frank, thank you for your very kind words. I try to write about the arts without jargon; it's opaque and nothing dates faster. As for the arrangements, they are just as visionary as the painting of them. There is a sense of 'ease' in McClosky's and Perkp's work. As if they were done without effort. The same is true of The Blue Lantern. Nothing worth doing is ever easy but it's still fun. You've done it again, Jane! The McCloskey paintings, especially the oranges, are exquisite. What a discovery. Tim, I would trade Renoir's "Onions" for McCloskey's "Oranges" in a heartbeat. And I cannot believe that his "Lemons" went unsold.